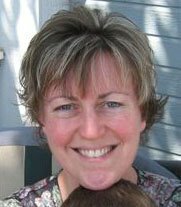 Sheep Thrills Farm: The Hit Squad -or- Where's the Mouse? The Hit Squad -or- Where's the Mouse? 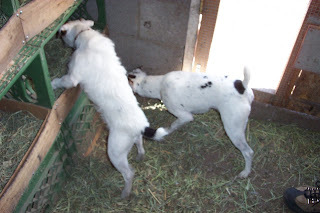 Here are Iley and Seamus checking out the corner of the barn where the chickens have their nest boxes. 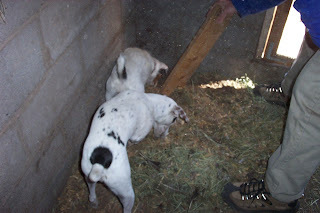 As soon as they were let loose in the barn, they both went immediately to the corner where we believe the mice were living. Bill and his daughter, Katie, and I were waiting for Ralph to come with a drill to unscrew the the anchors to the boxes. As soon as he arrived and the boxes were moveable, we took the boxes out...and mice went everywhere! Iley got so excited before we moved the boxes she kept climbing into the one closest to the corner where the mice were living. Here are both dogs busy at work. Mice ran everywhere to try to get away. Big ones, little ones and in-between ones! All sizes and shapes...It was an entire nest of the little buggers. No sooner than a mouse would try to run under us and towards safety when Iley would zoom! after it, kill it, then return to find more mice. Both dogs were so speedy all we could do was watch. Incredible! Only one mouse made it to safety by running straight up the wall into a crack between the framing and the cinder block. I'll set a few traps around tonight in this area and in the feed room just to make sure it doesn't come back. 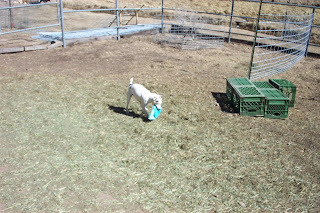 And finally, with a job well done, Seamus enjoyed "killing" a ball out in the paddock. It was an old ball that the sheep had only kicked around once or twice. The minute Seamus saw it he gleefully grabbed hold and "had a ball" with it, literally. I wish I had taken pictures of the dogs and Skittles. Both dogs tried to sniff noses with Skit, but it became obvious by Skit's ramming the fence that he was not impressed with the dogs. But , I'm so impressed with the dogs! They were wonderful and I thank Bill and Katie for bringing them over to help rid us of this problem. The only thing I forgot to do that I meant to do was get a couple of pictures of Bill and Katie. I'm sorry, Guys! Maybe next time I'll remember. This time I was just too amazed by how fast and hard these dogs worked. Cool! The whole family was waiting to hear what happened with the pups once I told them about it...I would SO love to have some of them around here. BTW-great idea for nesting boxes...I was admiring and taking notes! Thanks on the nest boxes. They are easy to care for - and you just have to make a carboard bottom so the nesting material won't fall out. Plus my DH screwed a bit of wood across the front to keep eggs from rolling out. 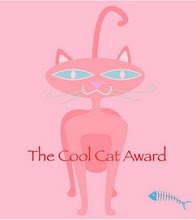 Just finished laughing out loud while reading Becca's weekend escapades with mice. Sounds like you'd better send Iley and Seamus her way! 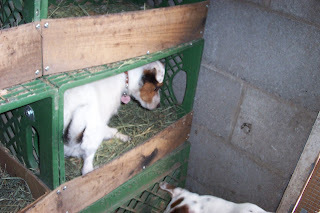 We have a Jack Russell that just LOVES to visit the barn with me---for the very same reason. Only our mice are hiding behind an eight foot stack of hay. She catches one every now and then--- but we'll get the rest of them eventually! Nice to have dogs that can snip/snap and do the job quick isn't it?! I need to hire these little guys to clean out my barn too. My lazy cats won't do it. Stretching Things Thin (I wish)! Shearing Day at Sheep Thrills! Eye in the Sky -or- Big Sheep is Watching!